Whose recommendations did voters follow in 2016? Below is a link to 3 pdf documents - one with all Warrant Articles on the 2016 main ballot, one for the SAU 90 ballot and one for the SAU 21 ballot. If you use the document on-screen (as opposed to printing it out) you will be able to link to other documents and images that may help to further explain the issues you will be asked to vote "up or down" on March 8th. The cornerstone of a true democracy is that individuals get to have their say, without some special interest group - or anyone - dictating how they should vote. However, voters need to be educated about the issues in order to make independent decisions. The best way to do this in Hampton is at the Deliberative Session. But not everyone can make it to the all-day-Saturday affair. Even for those who do attend, there is a lot of information to absorb. This website is intended to help inform voters about the local ballot issues - what they mean and what proponents and opponents say about them. What is a “Roundabout” and why should you care? A roundabout is a type of circular intersection, but is quite unlike a rotary. Roundabouts have been proven safer and more efficient than other types of circular intersections. Counterclockwise Flow. Traffic travels counterclockwise around a center island. Entry Yield Control. Vehicles entering the roundabout yield to traffic already circulating. Low Speed. Curvature that results in lower vehicle speeds, generally 15-25 MPH, throughout the roundabout. Roundabouts are often safer, more efficient, less costly and more aesthetically appealing than conventional intersection designs. The FHWA Office of Safety identified roundabouts as a Proven Safety Countermeasure because of their ability to substantially reduce the types of crashes that result in injury or loss of life. 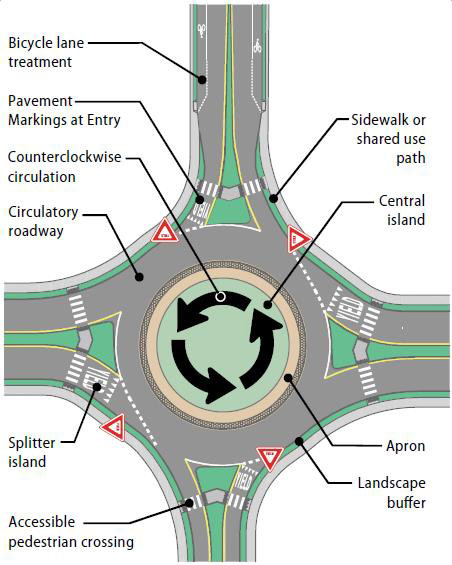 Roundabouts are designed to improve safety for all users, including pedestrians and bicyclists. If you use it on-screen, you will be able to link to other documents and images that may help to further explain the Articles. Please share this link with your friends, and remember to vote on March 8th! What it means: This petitioned article is suggesting that beginning with the 2017 voting cycle, the SAU 21 Moderator term would be changed from a one-year term to a three-year term. What people are saying: Other Moderators in Town have 3-year terms. Three years gives the elected Moderator time to become more experienced in the role. What it means: Repairs to the fields are requested as part of a phased approach to keep the facilities in good condition. What people are saying: This phased approach is kinder to the taxpayers and less disruptive to the activities at the school. What it means: This is part on an on-going project to refurbish the Heating, Ventilation and Air Conditioning system at Winnacunnet High School. SAU 21 Article 2: Collective Bargaining Agreement – Seacoast Educational Assoc. Those in favor say: The dollar increases are fair in relation to the “give backs” on health insurance. Those against say: The agreement is too generous, especially in contrast to the other Collective Bargaining Agreements in town. Note: Warrant Article #1 (operating budget) does not include appropriations in any other warrant articles. What it means: The proposed Operating Budget is $258,168 or 1% more than the Default Budget. What people are saying: The budget increase is driven by three large items: loss of revenue related to the end of 3-years of revenue from the LGC Healthtrust refund ($190,00 in 2015, nothing in 2016), cessation of 3 years of impact fees ($46,165 in 2015, nothing in 2016), and a decrease in the Adequate Education Grant ($31,000 less than 2015). Those 3 decreases in revenue account for $267,537. There have also been many line items with increases (notably increases in Information Technology and Vehicles), and the District has cut other line items in an attempt to control the overall budget. To see if the School District will vote to raise and appropriate funds in the amount of $45,600 to provide child benefit services, in accordance with RSA 189:49, for students who are residents of the Hampton School District and attend Sacred Heart School located in Hampton, New Hampshire. BY PETITION. (Majority vote required). What it means: Sacred Heart School is a private school in town. 48 Hampton residents attend Sacred Heart as opposed to attending the Hampton public schools. This Article asks for an offset for child benefit services in lieu of the taxpayers paying for the students to attend public school. Those in favor say: These students would otherwise be attending the public schools at an Average cost per student of $15,212. The Article asks for $950 per student. These funds help to cover a nurse, educational technology, supplies and textbooks. Funds are not used for any religious purposes. Those against say: One speaker had an issue with supporting a religious organization, even if the funds were not specifically used for religious purposes. Fiscal Impact: The average Hampton home valued at $329,000 would bear an increased tax cost of $5.40 in 2016 if this Article passes. Approval of this Article affects 2016 only. Shall the School District vote to authorize the School Board to accept conveyance of two parcels of property from the Town of Hampton on such terms and conditions as the School Board determine are appropriate, the first commonly known as the Arnold property, and the second being known as the Martel property? Both parcels abut the property of the School District on Academy Avenue and have been leased to and used by the Hampton School District for many years for school bus loading and unloading and staff parking. (Majority vote required). What it means: This is the corollary of Article 36 on the main ballot. The voters must approve both sides of the conveyance – the Town to deed the properties to SAU 90, and for SAU 90 to accept the conveyance. This would only be effective if SAU 90 Article 1 is approved by the voters. What people are saying: There have been many comments with regard to the Hampton Academy renovation (covered under Article 1), but we are not aware of any discussions specifically related to the conveyance of these parcels.